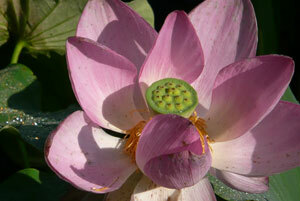 Nelumbo 'Rosy Clouds' lotus continues to flower magnificantly in the Victoria (upper) pool. The flowers open in the morning and close in the afternoon, for three consecutive days. They are delightfully fragrant. N. 'Rosy Clouds' is an excellent lotus for Colorado Gardens. ‹ Previous Article: Denver Botanic Gardens is at the Beijing Olympics!